Bulimia symptoms are usually not expressed publicly, and people with bulimia look completely normal and in most cases give the impression that they have no health problems. How to recognize this mental disorder, conduct treatment and prevent serious consequences of bulimia? This mental disorder is characterized by binge eating that bulimic person cannot control during eating, thus overloading your stomach until the body can reject food - vomiting. Symptoms of bulimia can occur in both sexes, although they are much more common in women than men. The disease such as bulimia and anorexia have the same mechanism of action: people desperately opposes weight gain, and this is a very inadequate and destructive way. With starvation, deliberate vomiting with different pills and appetite suppressants and diuretics and laxatives, stands always the same attitude: "I must not at any price to put on weight, at any cost I have to look thin." In most cases, the symptoms of bulimia occur in anorexic people who blame themselves for failing to hold long-term control urge for food. 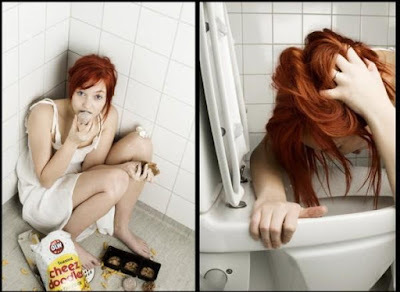 The disease such as bulimia is most common in women and often occurs in the context of borderline personality disorder, such as hysteria, depression, schizophrenia and various other phobias. Also it is an integral part of eating and anxiety because the person is in constant anguish that will gain weight. Bulimics are followed by the obsession with food and most of their time spend on the purchase and preparation of meals, counting calories when eating which then are ejected by vomiting. When you do not eat, they think about all possible permitted "and" forbidden "types of foods, which is understandable, because the exhausted body begs for food. Bulimia symptoms cause a person not to gain weight but look very thin and exhausted due to frequent vomiting. However, bulimics are still not skinny like anorexic because they eat and it is impossible to throw up everything they have eaten. Bulimia - What are the causes? Studies have shown that genetics in this case plays a big part, so if there were family members that already had bulimia, the chances that a person gets diagnosed with this disorder are much greater. Bulimia symptoms as the disorder is much more common in emotionally unstable persons and perfectionists. Parents who constantly criticize the physical appearance of their child and comment on the amount of food you eat, may also be the trigger for the disease. Another problem are the media that glorify thinness (often extreme), but women are under constant pressure whether they are enough beautiful and attractive and obsessively evaluate everything they eat. Fierce restrictive diets can also cause bulimia, because food is the most important thing in life. In addition to impaired mental status, the disease threatens the physical health as it often leads to vomiting, electrolyte imbalance in the blood. You are experiencing a lack of potassium and damage to bones and teeth, and kills liver, pancreas and reproductive organs. Women who suffer from bulimia often cannot get pregnant, while they have amenorrhea - absence of menstruation is a regular occurrence. Frequent symptoms of bulimia unfortunately leave consequences and the heart gradually weakens and if the disorder takes a long time there is a danger of developing serious cardiac disease, even death. Also, as a result of prolonged starvation affects sensitivity to cold, constipation, low blood pressure, slow heart rate, decreased body temperature and hormonal disorders. As is generally the word about mental disorders, adequate treatment of bulimia is not possible without the help of experts, and crucial is the support of family and the environment. It is unlikely that a person will figure out that they need help, but a person close needs to react immediately if something strange happens - and if there is the aforementioned bulimia symptoms. The bulimics by no means should not be condemned but should be provide d with support and understanding. It is a very complex disorder, and bulimia treatment interventions occupies the holistic approach. First of all, we need to work on the mental level and beat anxiety and other mental disorders. In this case, of a great help can be yoga, meditation and acupuncture, but also many herbs that help a person feel better and to keep binge eating under control. Combination of these methods reduces the incidents and causes bulimia symptoms to disappear. Recipe: Pour a teaspoon of finely chopped valerian with 2 dl of boiling water and leave it to stand covered for 15 minutes. Strain and drink before going to bed or, if necessary, several times a day. Balm tea – is used to treat a variety of neurotic disorders, especially anxiety, restlessness, insomnia, and organic diseases caused by mental state (cardiac arrhythmia, muscle cramps, high blood pressure). Recipe: Pour a teaspoon of finely chopped lemon balm with 2 dl of boiling water and leave it to stand covered for 15 minutes. Strain and drink before bedtime, or if necessary several times daily. St. John's wort tea - helps in the treatment of mild forms of depression and many other mental disorders. However, it should not be consumed in high doses or in combination with antidepressants because it diminishes their effect. Recipe: Pour a teaspoon of finely chopped St. John's wort with 2 dl of boiling water and leave it to stand covered for 15 minutes. Strain and drink before bedtime, or if necessary several times daily. Nutritionist advise all persons suffering from bulimia to eat every day oranges that accelerate the process of digestion and relieve the feeling of bloating and weight that accompanies this disorder. Each bite should be chewed well because in this way it quickly causes a feeling of fullness and prevents overeating. After each meal, go outside and take a walk for at least twenty minutes. You will stimulate digestion and eliminate tension and nervousness.